Those who dare to try out this infamous food might need a little bit of courage, due to the rather sticky texture and unusual smell of the beans. Originally is meant to be eaten with rice, but any kind of combination with a carbohydrate would be a good match. If you should try and do not like natto, do not worry: there are many Japanese who can not stand it either. Most famous area would be kansai: Japanese people there tend to not like the fermented beans at all. Please be considerate when expressing your feelings. Never use harsh words for describing food that is enjoyed by others. You would not want anyone to talk bad about your favourite dish either. If you happen to like natto, try out recipes. I love natto is dedicated to spread the word about natto. My personal favourite way of eating natto is as natto pan (natto on toast). While you toast the slice of bread, prepare the natto by opening the package, removing the plastic sheet directly on the beans, adding the yellow mustard and brown sauce and finally mixing it with either chopsticks or a tea spoon. Be careful not to poke the styropor package, since this might lead into the inside liquids dripping out of the package. Keep on stirring in circular movements, approximately 50-100 times. 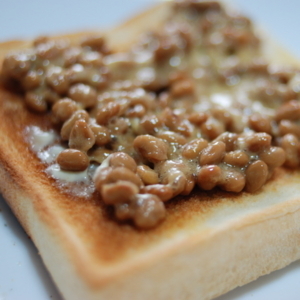 Once the natto has a rather creamy light colored texture, the toast should be ready. Butter the toast as soon as it pops out to ensure a warm surface for equally and easy butter spreading. Add the natto on top and voila: ready is your awesome dish! It’s great for breakfast with coffee, as light dinner with tea, or even just during meals whenever you feel hungry. Knowing easy Japanese makes your travel better! !